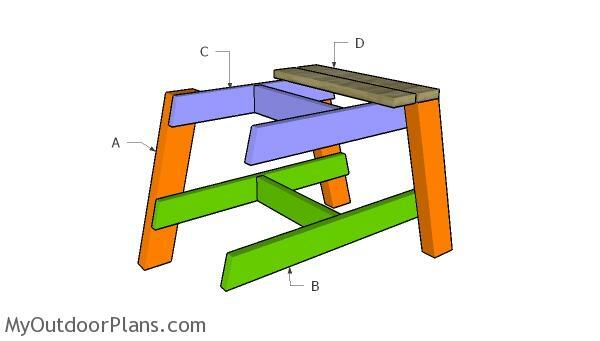 This step by step woodworking project is about modern side table plans. I have designed this modern outdoor side that goes perfectly with my other project with similar style (double chair bench, chair and footrest). This side table makes for a perfect addition to any patio, deck or pergola. Make adjustments to my plans so it suits your needs and budget. See all my woodworking plans HERE. When buying the lumber, you should select the planks with great care, making sure they are straight and without any visible flaws (cracks, knots, twists, decay). Investing in cedar or other weather resistant lumber is a good idea, as it will pay off on the long run. Use a spirit level to plumb and align the components, before inserting the galvanized screws, otherwise the bench won’t have a symmetrical look. If you have all the materials and tools required for the project, you could get the job done in about a day. Make sure you follow me on Facebook and Instagram to be the first that gets my latest plans and for some other exclusive content. Also, follow me on Pinterest and subscribe to my free weekly newsletter to get many ideas for your backyard from all the internet! See how you can Support Me with no extra costs to you. The first step of the project is to build the legs for the outdoor side table. 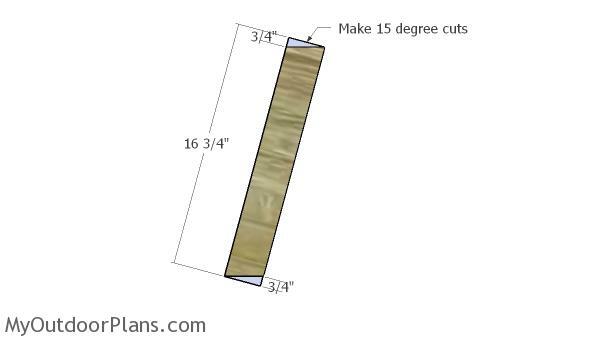 Use a circular saw to make the angle cuts to both ends of the legs. Use 1×3 lumber for the side braces. Use a saw to make the angle cuts and then lay all the components on a level surface. Align the edges with attention and drill pilot holes through the braces. Insert 1 5/8″ screws to secure the braces to the legs. The next step of the project is to lock the sides of the side table together. Therefore, drill pocket holes at both ends of the supports and secure them to the middles of the side braces. Insert 1 5/8″ screws and make sure the corners are square. 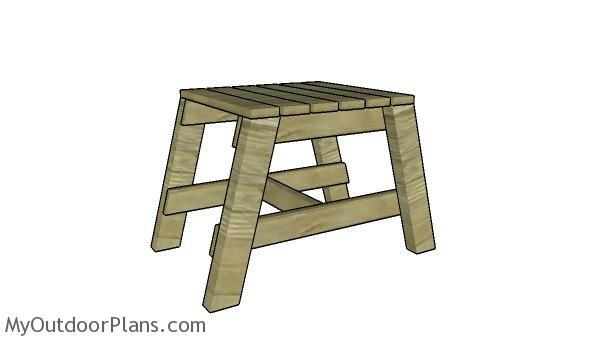 Attach the 1×3 slats to the top of the side table frame. 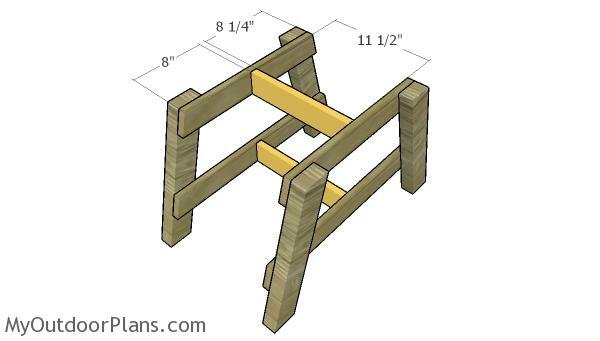 Place a piece of 1/4″ plywood between the slats, so you can create even gaps. Align the edges with attention, drill pilot holes and insert 1 5/8″ screws to lock them into place tightly. Fill the holes with wood putty and then smooth the surface with 120-220 grit sandpaper. 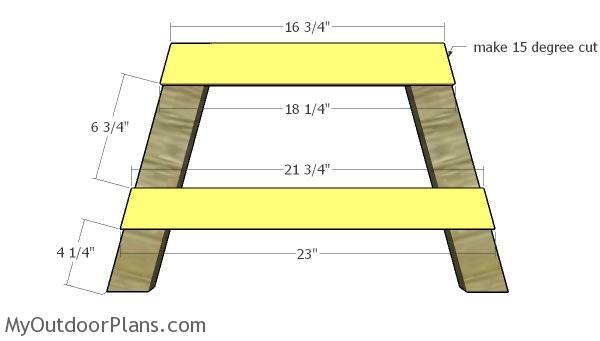 Apply a few coats of paint or stain on the outdoor side table, so you can protect the components from decay and to enhance the look of the project. Check out the double chair bench, the modern chair and the footrest. Top Tip: If you want to enhance the look of the project and to protect the wooden project from decay, I recommend you to cover the components with paint or stain. See my other woodworking projects HERE. 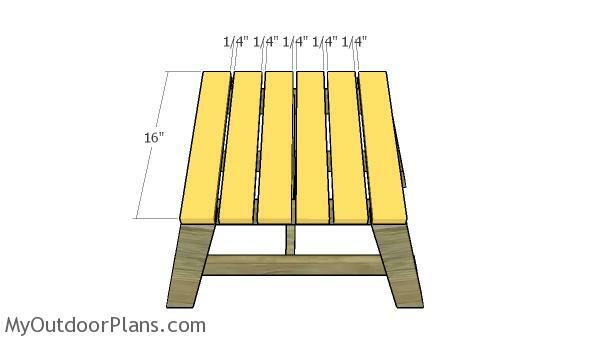 This woodworking project was about modern outdoor side table plans. If you want to see more outdoor plans, we recommend you to check out the rest of our step by step projects. LIKE us on Facebook and Google + to be the first that gets out latest projects and to hep us keep adding free woodworking plans for you.